Begum Rokeya University, Rangpur signed a Memorandum of Understanding (MoU) with Canadian University of Bangladesh on 08 July, 2017 at Canadian University of Bangladesh’s Banani Campus. Under this MoU, these two Universities agreed on academic exchange and cooperation. Prof. Dr. Nazmul Ahsan Kalimullah, BTFO, Vice-Chancellor, Begum Rokeya University, Rangpur and Prof. William H. Derrenger, Vice-Chancellor, Canadian University of Bangladesh signed the MoU. A Memorandum of Understanding (MoU) was signed between Begum Rokeya University, Rangpur (BRUR) and Bangladesh Army University of Science and Technology (BAUST), Syedpur at the vice-chancellor’s office of BAUST in Syedpur recently. 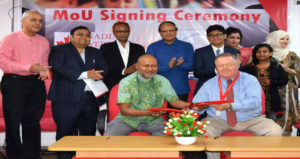 Vice-chancellors professor Nazmul Ahsan Kalimullah of BRUR and brigadier general Md Lutfar Rahman of BAUST, Syedpur signed the agreement on behalf of their respective universities on 17 May, said a press release. 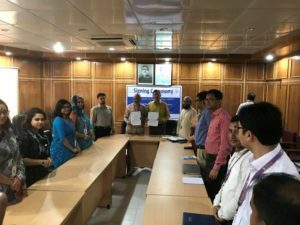 Begum Rokeya University, Rangpur signed a Memoranda of Understanding with AIBS earlier this month during AIBS President, Dr. Golam Mathbor’s trip to Bangladesh. MOUs serve as a foundation for mutual cooperation and exchange in the fields of research, faculty and fellow exchange, and future conferences and research activities between partner institutions and AIBS. A Memorandum of Understanding (MoU) was signed between the Centre for Peace and Justice of BRAC University (CPJ BRACU) and Dr. Wazed Research and Training Institute of Begum Rokeya University, Rangpur (DRWTI BRUR) on 5th July 2018 at BRUR campus. Vice-Chancellor of BRUR and Director of DRWTI, Prof. Dr. Nazmul Ahsan Kalimullah, BNCCO and the Executive Director of the Centre for Peace and Justice of BRACU Barrister Manzoor Hasan OBE signed the MoU on behalf their respective institutes. BRUR signed MoU to a motive of academic collaboration with Universities and Institutes throughout the country and the whole world. BRUR Honorable Vice Chancellor Professor Dr. Major Nazmul Ahsan Kalimullah, BNCCO declared to uphold BRUR in a World Class University and BRUR is in a fast forward move to its goal. The MoU obviously will help BRUR to share knowledge and collaborative participation in both Research and Development.